The MAX6MUM SECURITY 10″ (250mm) Anti-Vandal letterbox is the letterbox of choice for anyone concerned about home security. Every letterbox comes with both an external and internal flap to protect your home, and also is supplied with fitting screws! If you are looking for a way to protect your post as well as preventing burglaries from people putting their hands through the letterbox, then the 12 inch Anti-Vandal MAX6MUM SECURITY letterbox is a fantastic choice. 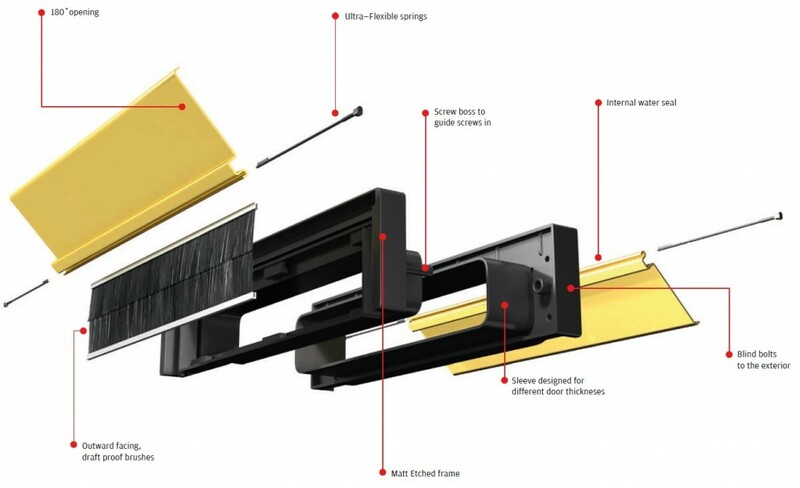 Each letterbox comes with both an external and internal flap to protect your home, and is available in 2 different depths (20-40mm for uPVC doors, and 40-80mm for composite and wooden doors). 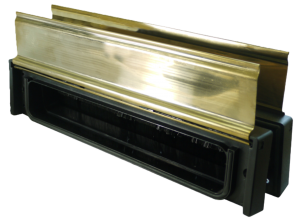 Anodised gold, anodised silver, black and white finishes have been developed from aluminium to last longer than other letterboxes currently in the market, and comes with a 10 year colour fast guarantee (so the colour won’t fade in the sun). In addition to this, the anodised silver door knocker has also been spray tested for 480 hours to ASTM B117 to ensure durability, coming with a 5 year inland guarantee. Polished gold and polished chrome finishes have been developed from 316 grade stainless steel, and is part of the Nanocoast range of products. Each product in the Nanocoast range has been spray tested for 2,000+ hours to ASTM B117 to ensure durability, coming with a LIFETIME guarantee anywhere in the country. This door knocker is ideal for coastal locations, where the salt in the sea air usually pits and corrodes door hardware products made from brass and zinc, and also in locations which are close to highly populated industrial areas! 2- It is easier for postmen to navigate letters through the brushes, so you won’t end up receiving crinkled letters anymore. 3- The brushes stop draughts at the point of entry, making the letterplate draught-proof. 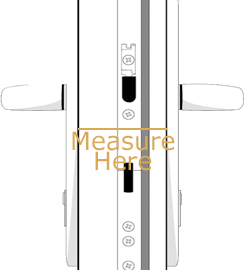 Each MAX6MUM SECURITY mirror polished letterbox flap can open to 180 degrees, meaning that it should not snap if listed up too far. Many letterplates available only open to 90 degress, so when too much force is applied when lifting the flap up, it causes them to snap off. Ultra-flexible springs means that the letterbox can withstand thousands of openings without breaking, making them last even longer! An internal water seal also prevents water getting into the door or panel. which stops letters getting wet as they are posted through the door. The water seal also helps to prevent the flaps from pitting or rusting! The hidden fittings of the letterplate made burglary very difficult as it is nearly impossible remove it from the outside. The blind bolts make external removal impossible. With the regular traffic this door hardware will get it’s only natural to worry about visible markings on it from scratches either from fitting or from everyday use. The matt coat helps make any markings nearly invisible to the naked eye. Also, the matt coated frame helps to conceal any scratches which are caused by screwdrivers at the time of installation. Fitting your new MAX6MUM SECURITY® Anti-Vandal™ Letterplate is easy and in most cases only requires a screwdriver. The Anti-Vandal™ Letterplate has 2 parts – the exterior part with brushes and the interior part. We have also supplied fixing screws. 1- Take out your existing letterplate by removing the screws on the inside of the door. The letterplate will then slide out, leaving a cavity in the door. 2- Take the interior part and see if it will fit through the existing hole in the door*. If it does then lift the flap and push the interior part through the door and hold it with one hand. With the door open, slide the exterior part into the door cavity and it will slot into the interior part. 3- Line up the two parts of the Anti-Vandal™ Letterplate perfectly and then use the 2 screws supplied to secure the interior part. 4- Use a screwdriver to tighten it up but do not use power tools to tighten up the screws. 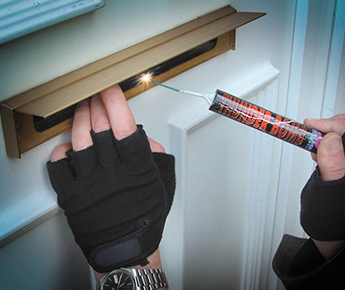 *If the Anti-Vandal™ Letterplate does not fit through the cavity, then depending on the door material, open the cavity slightly using a saw, sander or Stanley knife. The cavity needs to be 43mm high by 288mm wide. Once done follow the instructions above. Gently wash the letterplate with a mild soap solution twice a year to remove any dirt and grit that may build on the surface. We guarantee that the letterplates will not fail mechanically in normal use during the 5 year guarantee period subject to the conditions outlined above.